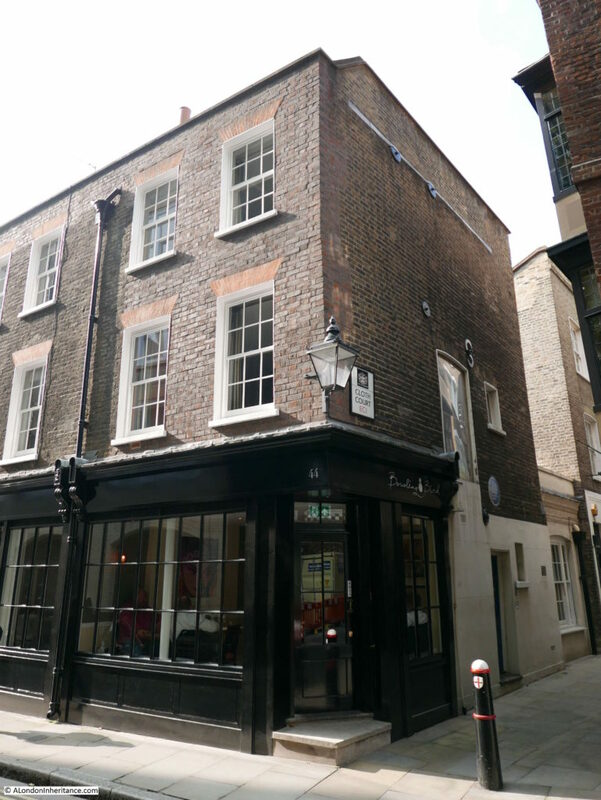 For this week’s post I am in Cloth Fair, a street just off West Smithfield with a name that goes back to the early days of the Bartholomew Fair held here when the fair was a centre for cloth merchants from across the country. The focus of my father’s photo was the taller of the buildings with the bay windows. These are numbers 41 and 42 Cloth Fair, the oldest residential buildings within the current boundaries of the City of London. Construction of these buildings started at the end of the 16th century with completion early in the 17th, at a time when the area was within the walled compound of St. Bartholomew’s. They survived the Great Fire of London, and as my father’s photo confirms, they also survived the blitz. My father’s photo was taken from up against the church where, typically for photographing London today, there was building work underway, so my photo is from further along Cloth Fair, but shows the buildings are much the same today. The buildings were almost lost early in the 20th century when they were classified as dangerous structures. The architects Paul Paget and John Seely bought the buildings in 1930 and carried out a very sympathetic restoration. 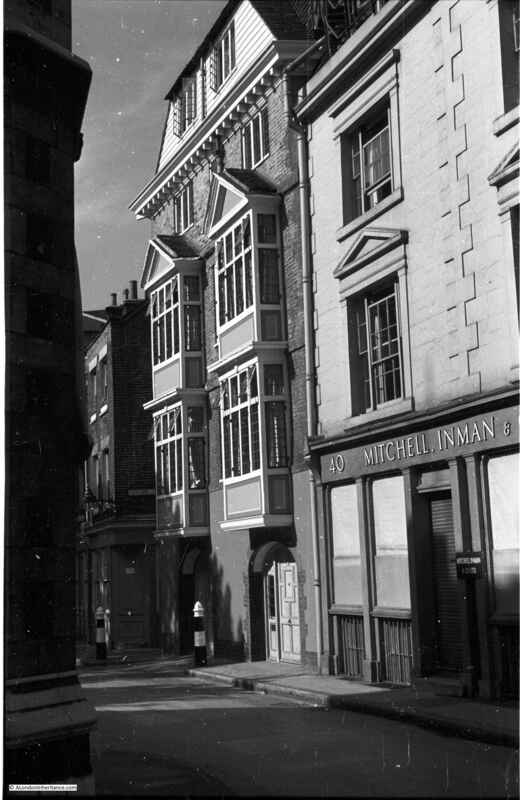 They continued living and working together in number 41 and their success enabled them to purchase and restore many other buildings in Cloth Fair. By 1930, 41 and 42 Cloth Fair had already survived other major changes in Cloth Fair. Up until the start of the 20th century Cloth Fair and the surrounding area included numerous crowded alleys with very unsanitary conditions. The Corporation of London Sanitary Committee condemned many of the buildings in 1914 and their demolition was completed soon after. 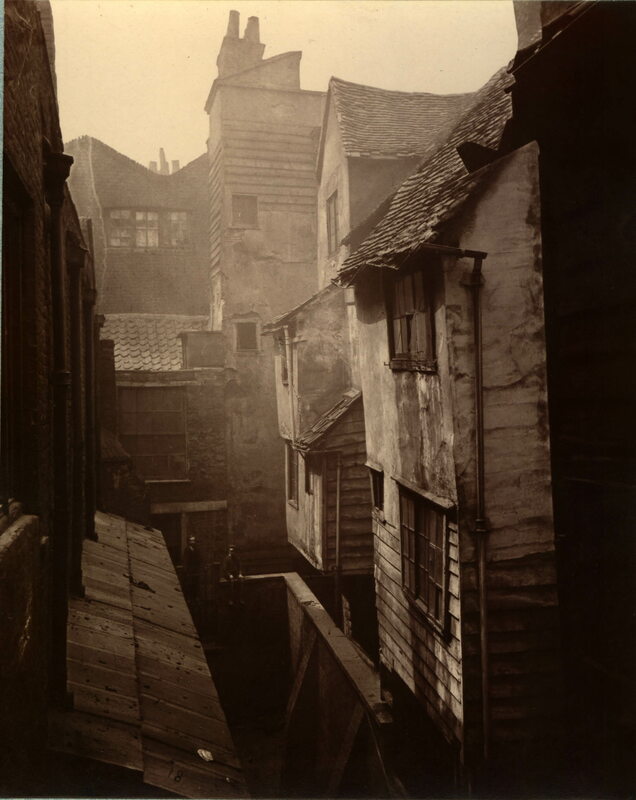 The British Museum has some photos of the alleys around Cloth Fair taken in 1877 by A. Bool for the Society for Photographing Relics of Old London. 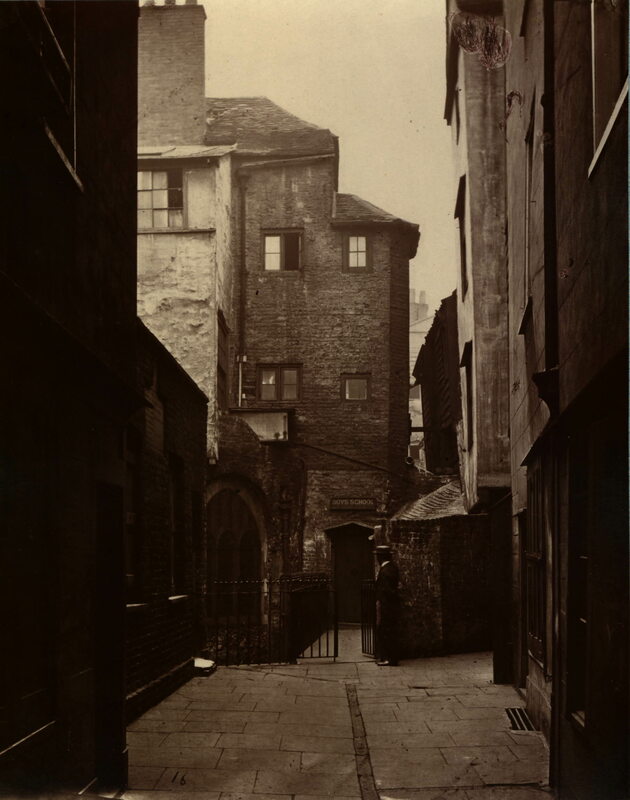 These photos (©Trustees of the British Museum) show ancient buildings crowded around narrow alleys. 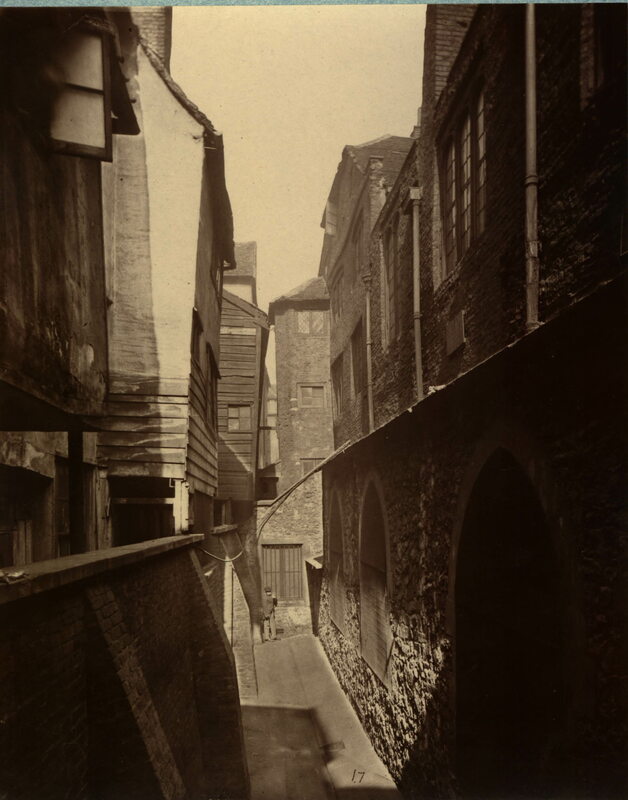 The following photo shows not only the narrow alleys around Cloth Fair, but also how Cloth Fair has changed over the years. The photo shows a narrow alley. A small child is at the end of the alley and on the left are houses leaning over the alley to get a small bit of additional space for the upper floor. Look to the right of the photo and there is a substantial stone building. I found the above photos after I had walked along Cloth Fair, so I could not get a photo in the same position, however after looking again at my photos it was clear where the above photo was taken. On the right in the above photo there are three arches at ground level. Above this, there is a roof, leading back to a higher stone wall with windows and drain pipes. Towards the end of the alley, the building on the right is higher still, with an angled roof. 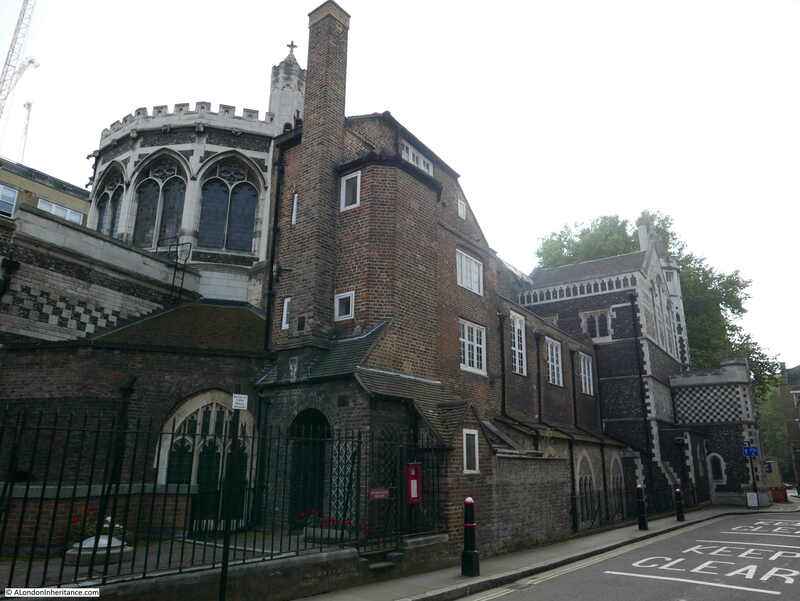 Now look at the photo below and it is clear that the building on the right in the above photo is the side wall of the St. Bartholomew the Great. The original photo was taken roughly were the furthest bollard is now located, looking towards the nearest bollard, which is roughly where the child was standing. Two of the three arches can be clearly seen, as can the roof above, the windows and drain pipes. Getting closer to the camera, the building rises a level with an angled roof, as in the original photo. The houses on the left of the original photo were where the “Keep Clear” signs are on the road today. 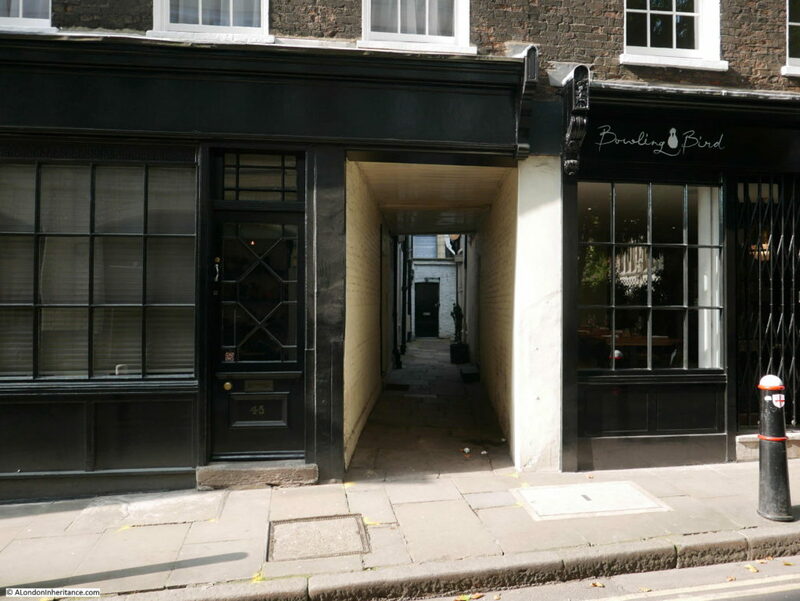 This alley was not Cloth Fair, but ran parallel to the church where Cloth Fair should have been, so how did this work? Cloth Fair can be seen running left to right across the map. Below Cloth Fair is St. Bartholomew the Great. Look just above the church, and between the church and Cloth Fair, running half way along Cloth Fair is another row of houses with a narrow alley between the church and Cloth Fair. This is the alley in the photo. The alley and houses have clearly disappeared since 1895, however that cannot be the full story otherwise there would be a much larger space today, where the alley, houses and Cloth Fair were located. 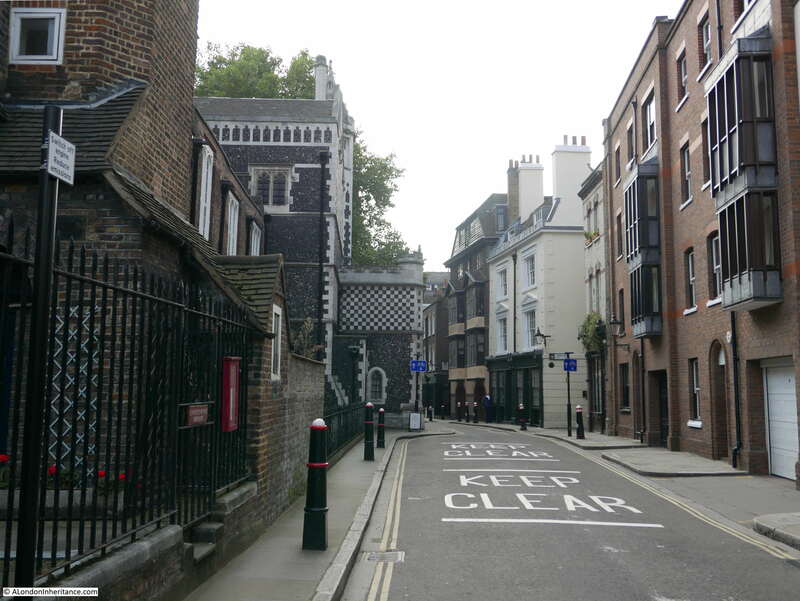 The angle of the route of Cloth Fair as it runs past the church to the right has been changed. 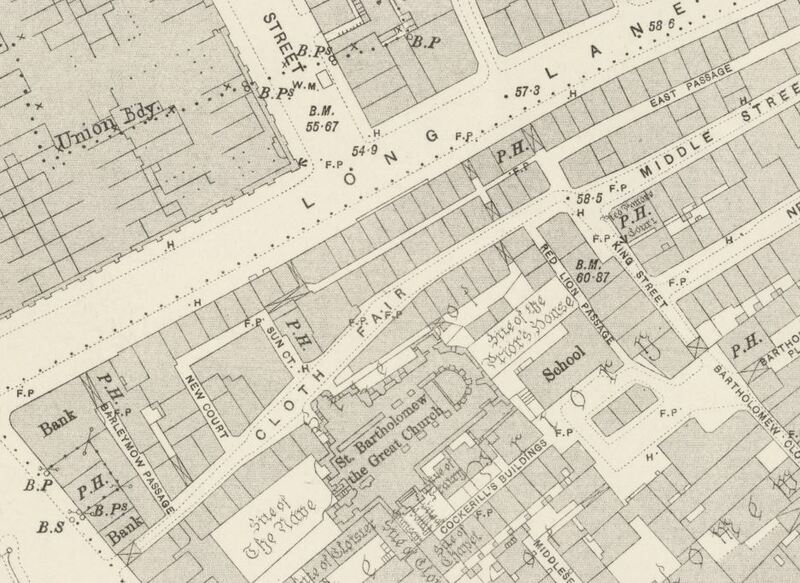 In the 1895 map, the junction with Middle Street is slightly offset, today Cloth Fair runs straight into Middle Street. Cloth Fair today is also running parallel to the church. The British Museum collection also has the following photo, which I believe is taken in the same alley, but this time looking in the opposite direction as to the photo above, now with the church of St. Bartholomew on the left of the photo. 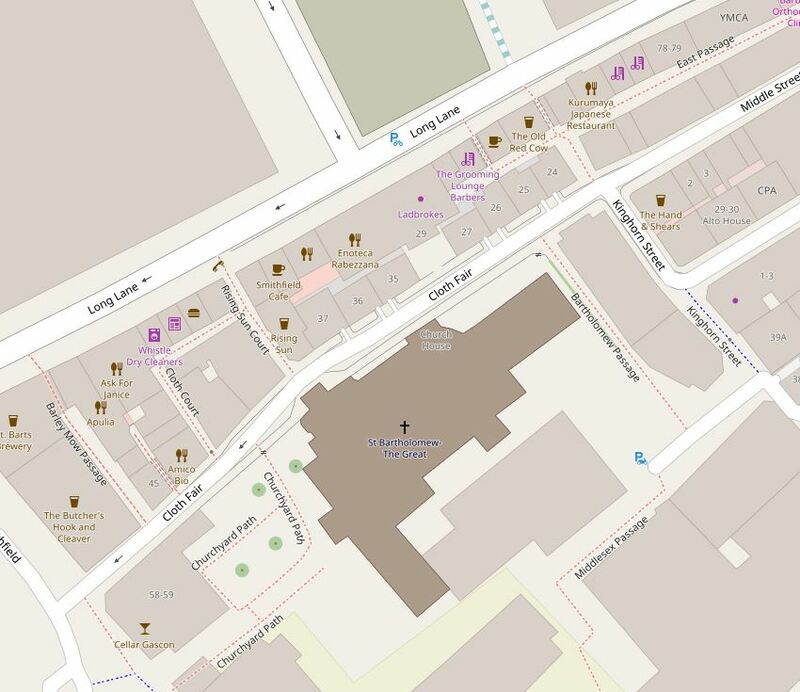 This is looking towards the where the alley exits onto Cloth Fair in the 1895 OS map. In the photo below, the alley in the above two 1877 photos ran along the footpath on the left, and the majority of the road was occupied by the houses in the photo. The original Cloth Fair ran along the footpath and partly under the buildings on the right. In the above photo there is a building projecting out at the end of the low roof leading up from the bottom left of the photo. This is the entrance porch seen in the photo below with the black and white patterned roof. So even along streets as old as Cloth Fair, we can never be sure we are actually walking along the route of the original street. Along this stretch of the street today we are walking along the old alley and where the houses once stood. There are many other lovely buildings along Cloth Fair. 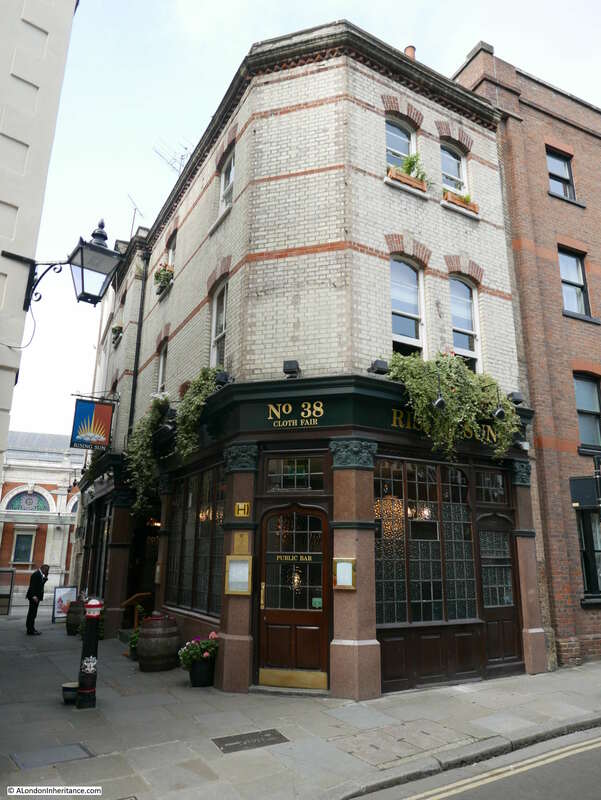 This is the Rising Sun pub at Number 38. A pub has been at this location for a number of centuries. 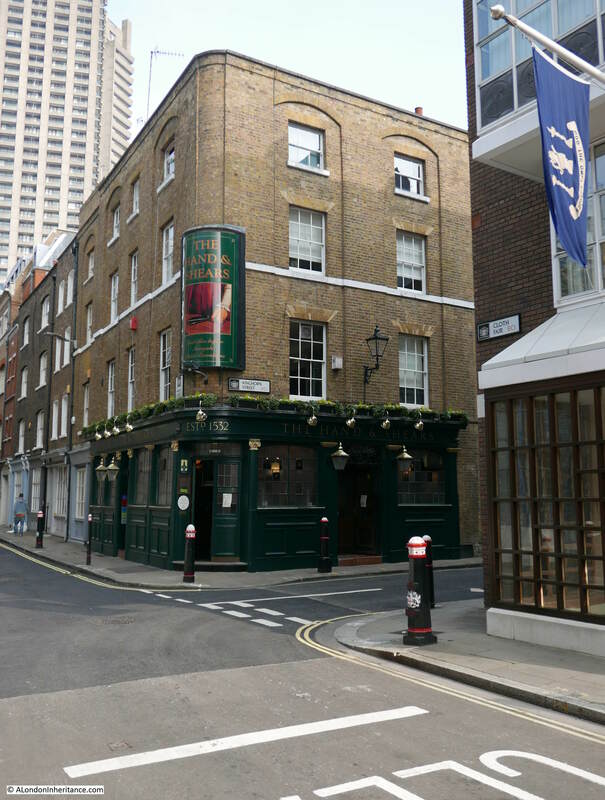 I can find newspaper reports mentioning the pub going back to the start of the 19th century, and the pub is (although not the same building), much older. 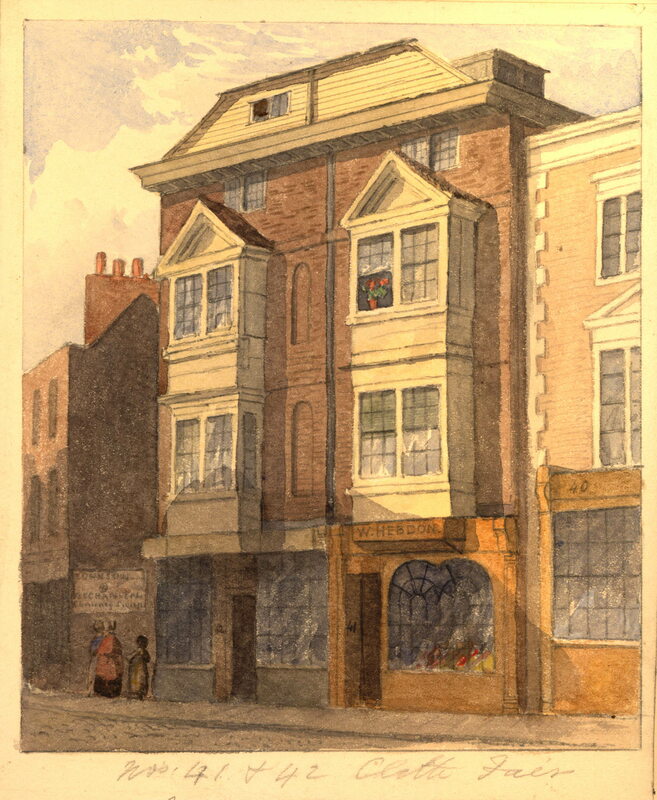 “On Monday se’nnight, some thieves during the busy period of the evening, it being at the time of Bartholomew Fair, broke into the upper apartments of Mr William Sawyer, of the Rising Sun, Cloth Fair, and carried off all the wearing apparel, some sheets, and two watches, &c., to the value in the whole of £60 with which they decamped, and have not yet been discovered”. The building was home to Sir John Betjeman from 1954 for 20 years. He moved into the building after meeting Paul Paget and John Seely and seeing their restoration work in Cloth Fair. The building is now owned by the Landmark Trust. 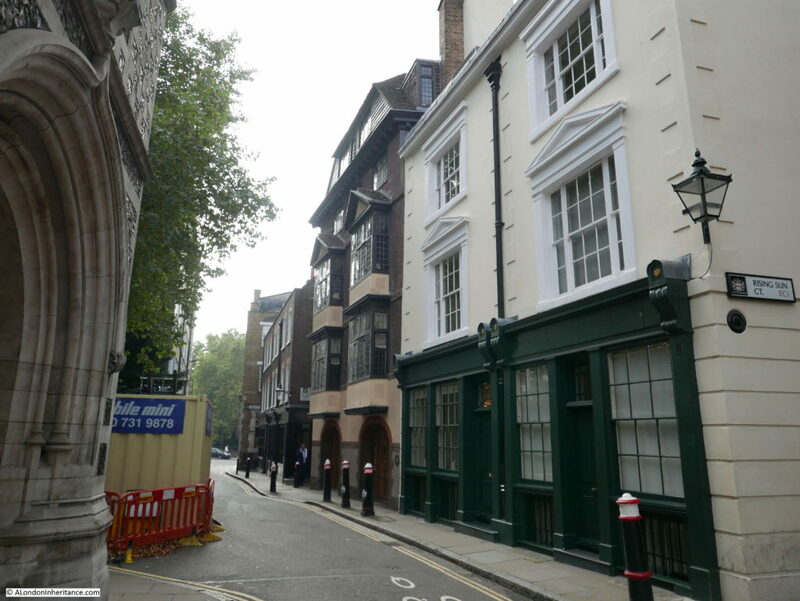 Although Cloth Fair has lost many of the alleys that lined and led off from the main street, there are still a few that remain to give a limited sense of what the area was once like. The buildings that line Cloth Fair are fascinating, as is the history of the street and association with the Bartholomew Fair, however after finding the photos of the alleys and the alley that once ran along the edge of the church, it was being able to place the alley, and the realisation that streets I thought were original have slightly changed their route over the years that was really pleasing. 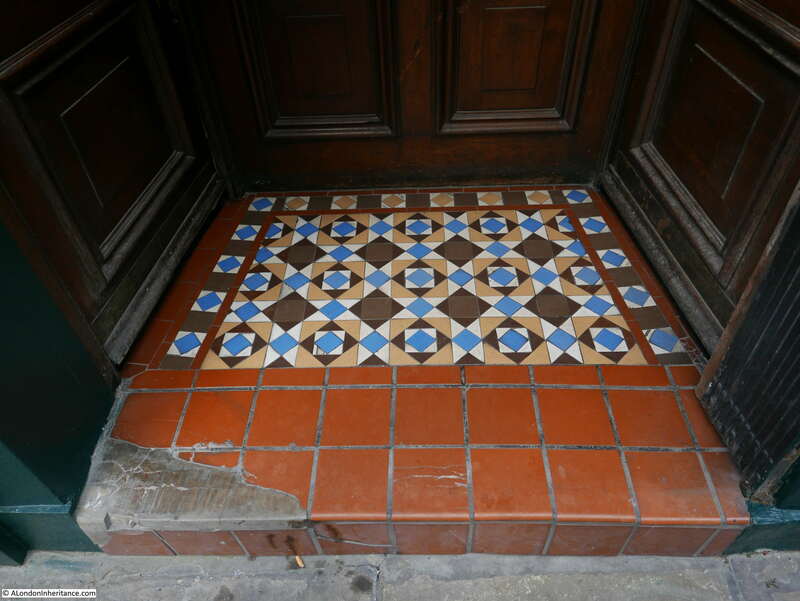 It is these little details that make walking London’s streets so interesting. This entry was posted in London Streets and tagged Cloth Fair, St Bartholomew the Great, West Smithfield on November 5, 2017 by admin. The following photo was published in a January 2016 post covering locations I had not identified. I have no idea why I did not recognise this pub, having walked past it many times and been inside on a number of occasions. The sign on the front also had part of the name. 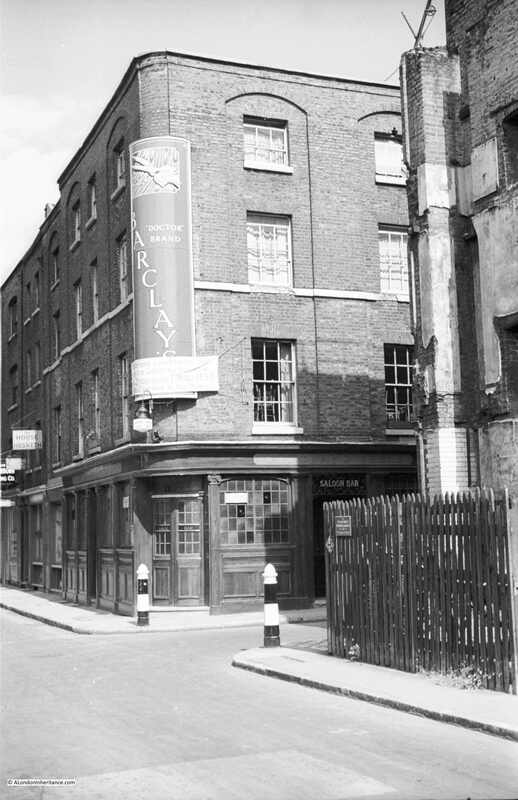 Luckily there were a number of readers more observant, or with a better memory than me as it is the Hand and Shears at 1 Middle Street at the junction with Cloth Fair, close to Smithfield Market and the church of St. Bartholomew the Great. The photograph was taken by my father in 1952. 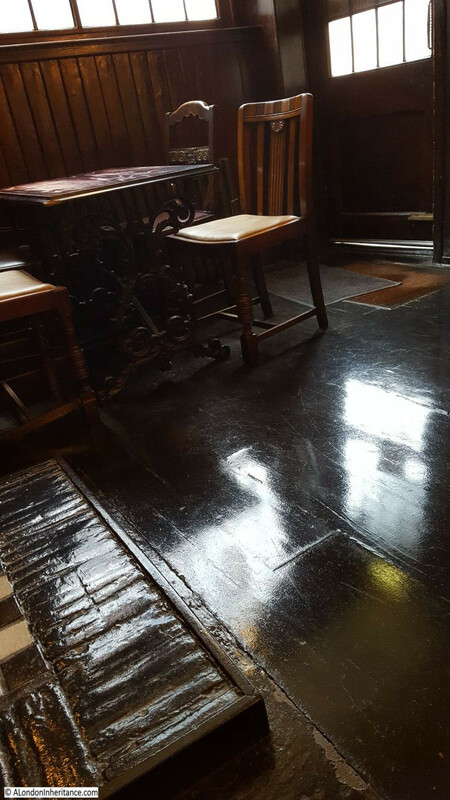 Last week I had the opportunity for a visit to the pub which is still looking very good, sixty-five years after my father’s photo. The words before Shears must be ‘Hand and’ and I suspect after 1552 it may have read ‘for years’. The Justices Licence refers to the Alehouse Act of 1552 which defined in law that it was illegal to sell beer or ale without the consent of the local Justices of the Peace. This was the first time that a licence was required to sell beer and ale and was an attempt to address the drunkenness and disorder that was being caused by the widespread availability of alcohol. The Act required that each person granted a licence was responsible for maintaining good behavior at their premises and any problems could result in a fine or loss of licence. 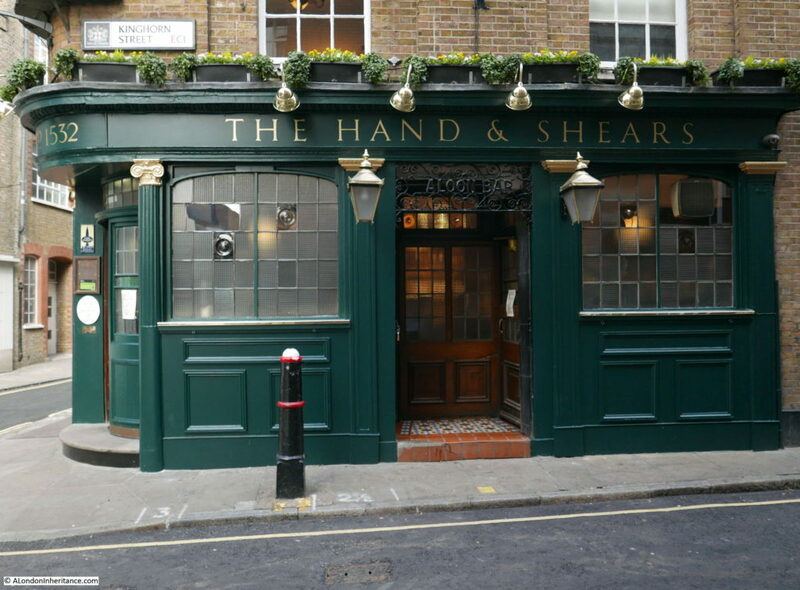 From the sign it appears that the Hand and Shears was granted a licence in 1552. 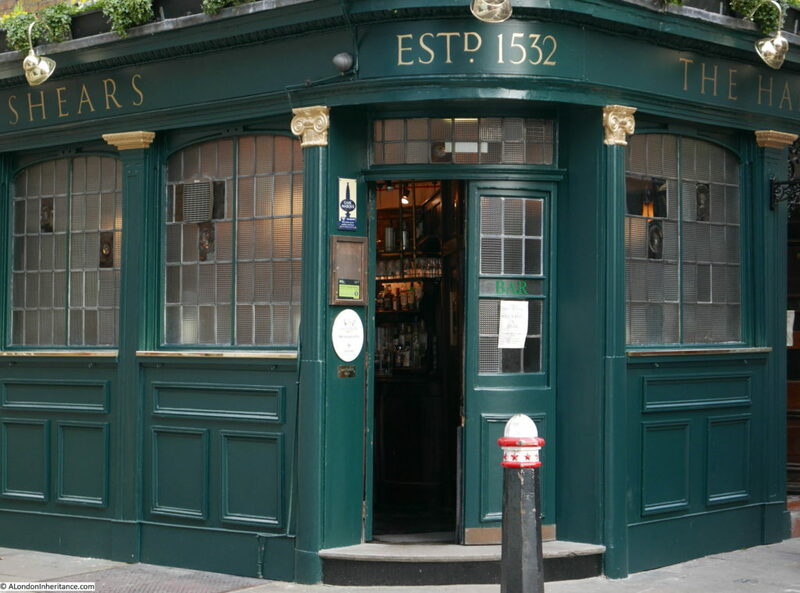 The pub must have been working prior to the grant of a licence as a sign above the door states that the Hand and Shears was established in 1532 so a pub has been on the site for almost 500 years. One more comment about the large sign on the 1952 pub, it is also advertising the brewery Barclay’s “Doctor” brand. This referred to beer brewed by the brewery that had a picture of Dr Johnson on the label. The building that the Hand and Shears occupied in the photos above obviously does not date from 1532. 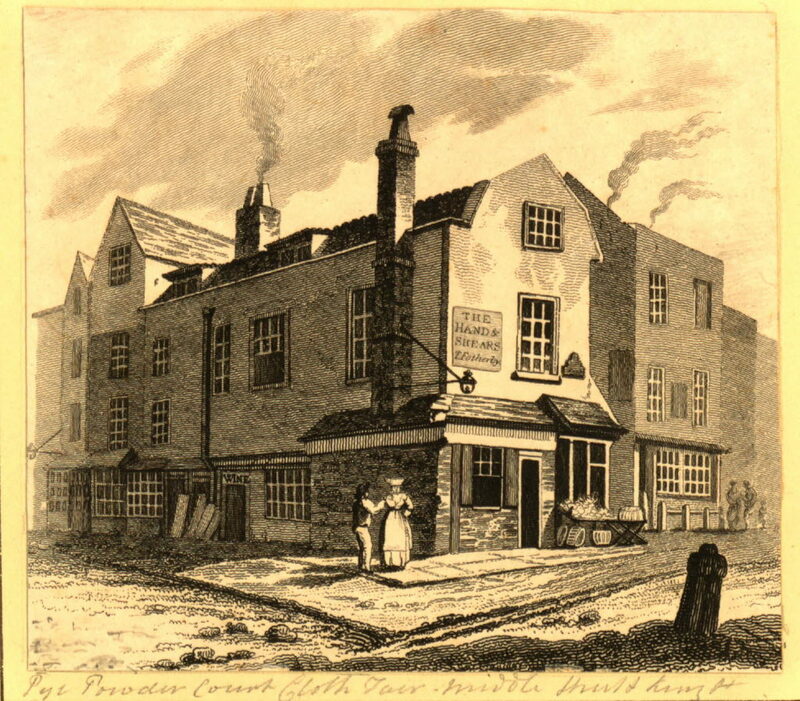 It was built around 1852 as the following picture of the pub is dated 1852 and is of the new building of the Hand and Shears. It has hardly changed in 165 years. The name Hand and Shears probably originates from the early days of Bartholomew Fair when it was the England’s main cloth fair. I have read a number of different sources attributing the name to either the use of shears at the fair, the cloth workers or the Mayor of London opening the fair by cutting the first piece of cloth. The Hand and Shears prior to the nineteenth century building occupied the building shown in the following 1811 etching. 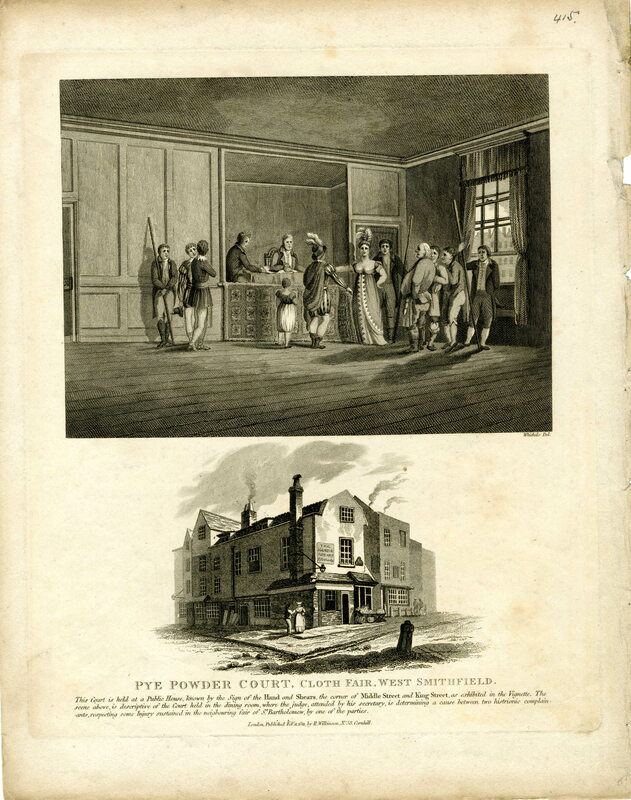 The title to the above etching is Pye Power Court, Cloth Fair. Pubs provided many functions to their local community in addition to selling beer. Inquests would be held in the building, meetings of various societies, they organised sporting events and for the Hand and Shears there was the special role of the hosting the Pye Powder Court. A Pye Powder Court dates from medieval times when the role of the court was to have jurisdiction over disputes between merchants and the public at a market or fair. They would also cover any other general dispute arising on fair grounds. The name Pye Powder comes from ‘pied puldreaux’ the French word for Pedlar. 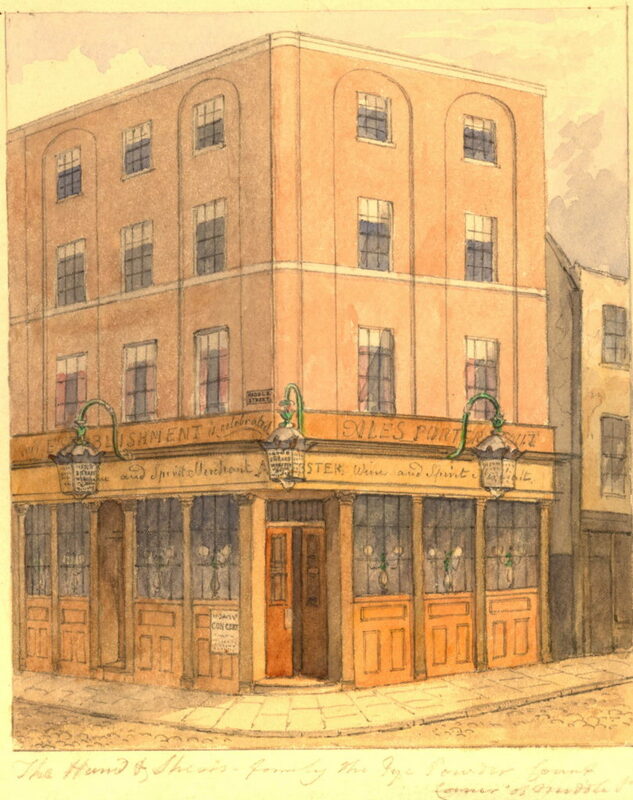 The Pye Powder Court held in the Hand and Shears had jurisdiction over the Cloth Fair and later Bartholomew Fair in nearby Smithfield. The terms piccage (money paid at fairs for breaking ground for a booth) and stallage (rental or fees for holding a stall in a market), like Pye Powder both have French origins so must date from the medieval period and the use of French for many legal regulations after 1066. As well as the Pye Powder Court, other activities carried out at the Hands and Shears included inquests into deaths. There are numerous reports of these and they show the almost casual nature of death and lack of accountability in the city – I would recommend a read of 19th century newspapers for anyone who today criticises red tape and health and safety. 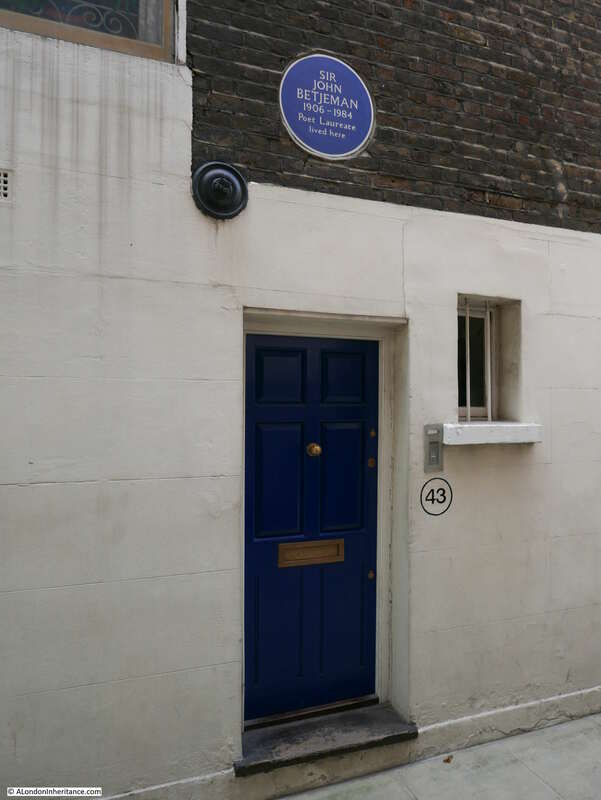 “FATAL ACCIDENT IN REDCROSS SQUARE – On Tuesday, the Coroner held an inquest at the Hand and Shears, Cloth-fair, on the body of George William Killby, aged 19 years, son of Mr. Inspector Killby of the City Police Force, whose death was occasioned under the following circumstances – On Monday, the 6th instant, the deceased and a young man named Joseph King, were walking along the above square on the foot-pavement, and upon arriving nearly opposite the gateway of Messrs. Treggon’s zinc manufactory, a loaded van was being drawn out of the gateway by a man in their employ, two others pushing behind, when, in consequence of there being a slight decline, the van overpowered them, and the off shaft pinned the deceased against the wall, the near shaft making a hole in the wall. He was extricated as soon as possible, and removed to his residence in Bartholomew-close, and Mr. Timothy, surgeon, of Barbican, attended him, and rendered every assistance; but he gradually declined and died on Saturday from inflammation of the bowels, the result of the injury. A full view of the Hand and Shears. 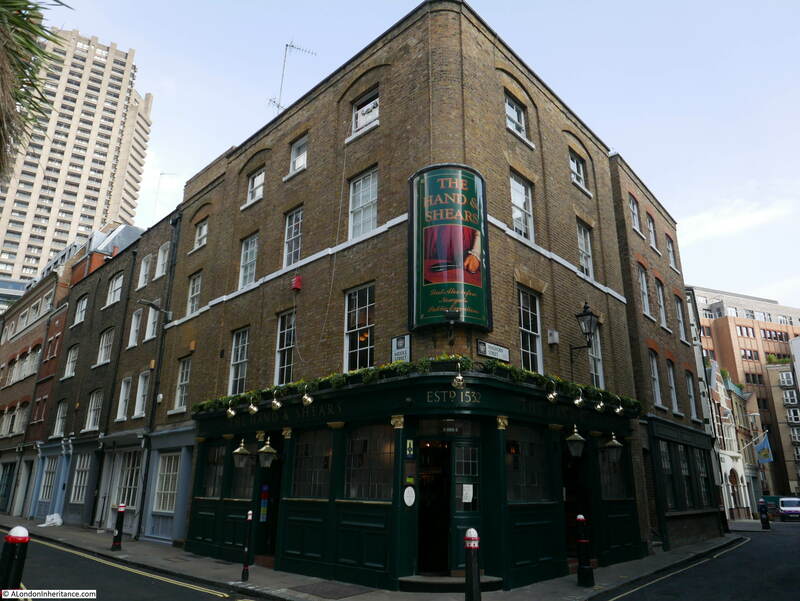 The sign today boasts that the pub is the opportunity for the Last Ales before Newgate Public Executions. The Hand and Shears was also the meeting place of the Bartholomew Club, a club of local people who met to discuss current political issues and points of historical interest, and the London City Press on the 22nd December 1868 reports on the annual dinner of the members and friends of the club, held in the Hand and Shears where a “substantial and satisfactory” dinner was provided. There followed a very large number of toasts, and proposing the health of various members and at the end “the company departed after spending a very agreeable and harmonious evening. Internally the Hand and Shears is a wonderful pub. A central island bar around which are the public and saloon bars (although there is very little difference between the two). I visited on a Tuesday afternoon which probably explains why it was so quiet, it is usually much busier at lunchtime and evenings. It is fascinating to sit in the Hand and Shears with a pint and contemplate all the people and events that have taken place here over the years. 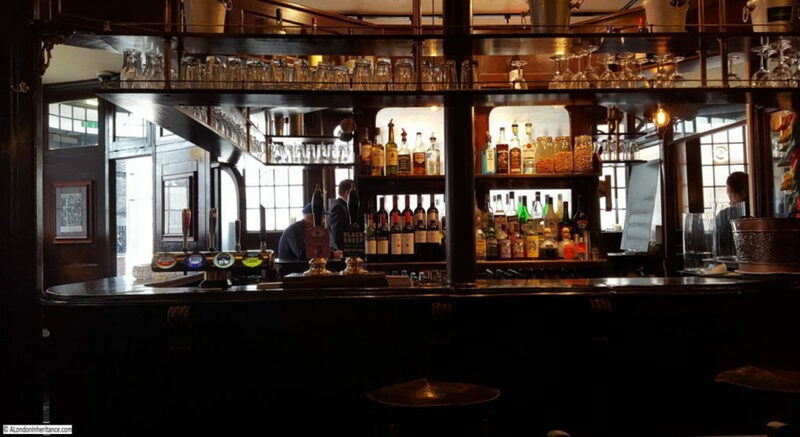 Both the exterior and interior of the pub appear to have hardly changed since the pub was built. Whether it will remain in the future must be a concern given the fate of so many pubs across London. 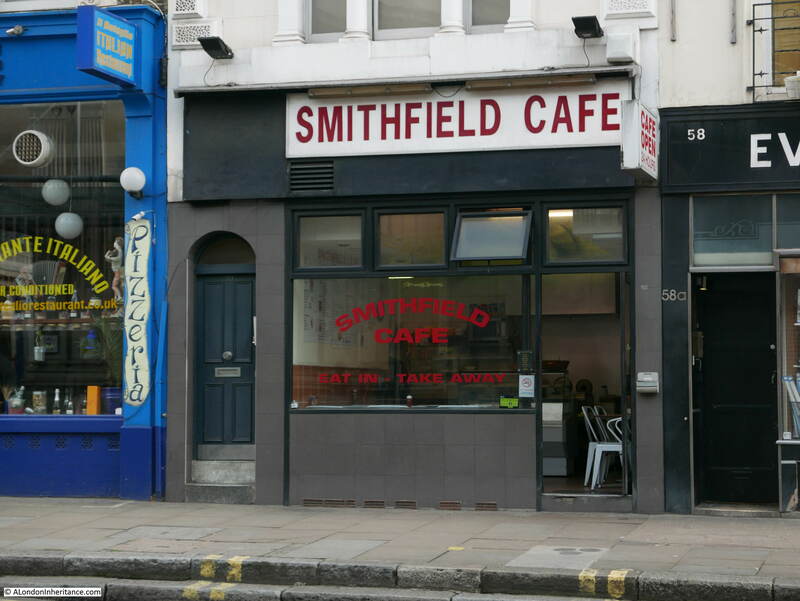 The area around Smithfield will change considerably over the coming years. 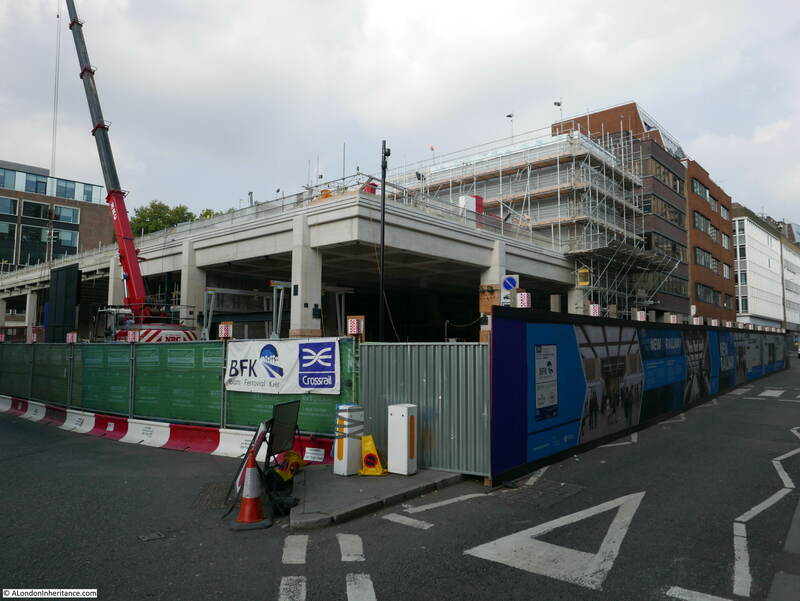 Walk through the short passage opposite the Hand and Shears to Long Lane and a sign of these changes can be seen in the form of the new Farringdon Station on the Crossrail / Elizabeth Line. Future Smithfield developments also include the relocation of the Museum of London which will occupy part of the old market buildings. This area will change significantly. As well as the Hand and Shears, there are a number of long-standing small businesses in the area. 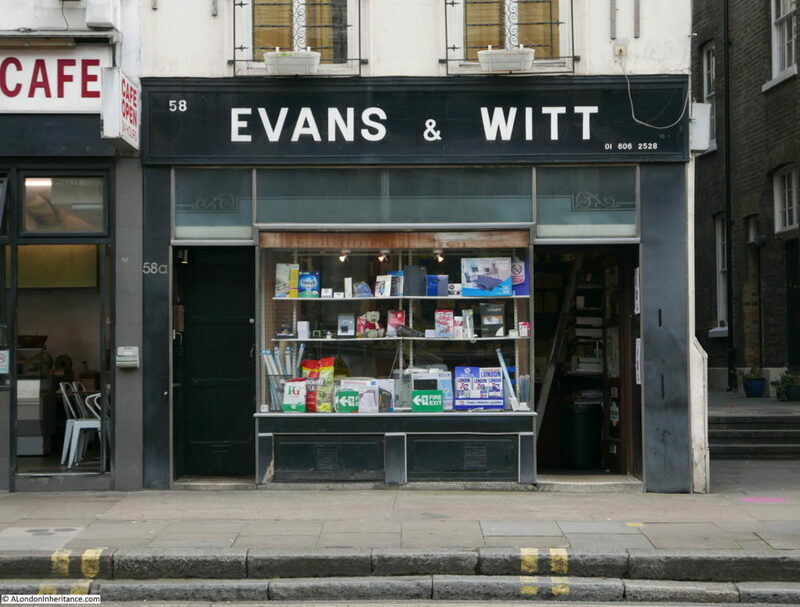 Along Long Lane is Evans and Witt (supplier of all manner of office supplies) which still retains the 01 telephone number on the facade. Many of the pubs my father photographed have disappeared. I have already written about the Tiger Tavern, the Gun Tavern and the Ticket Porter, so it is great to see the Hand and Shears still in business and much the same as when he took the original photo back in 1952. I hope it stays as it is and in business for many years to come. This entry was posted in London Pubs and tagged Bartholomew Fair, Cloth Fair, Hand and Shears, London Pubs on October 1, 2017 by admin.